Ichthyologyexplores evolution, biodiversity, genomics, morphology, ecology, biogeography, and life history of fishes. These studies are grounded in our research collections that represent a major worldwide resource for anatomical and genomic investigations of fishes and vertebrates. 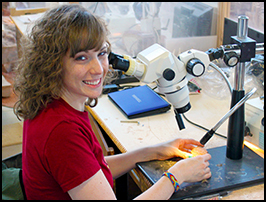 The Division of Ichthyology also provides significant training and educational opportunities for undergraduate and graduate students interested in fish biodiversity, research, and collections. The University of Kansas Ichthyology collection contains more than 680,000 specimens and approximately 11,000 tissues of fishes from around the world and is the basis of the research and educational activities of the Division of Ichthyology. Our collections data are accessed tens of thousands of times every year via the Internet, while specimens are loaned to researchers throughout the world, and used through on-site visits. The preserved specimen collection has an emphasis on freshwater fishes of the central United States and also has significant marine and estuarine collections. The skeletal preparations and tissue collections are worldwide in scope. 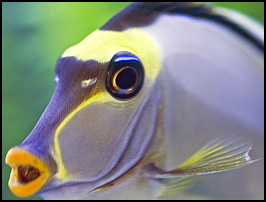 Venomous fishes pose a serious human threat with >50,000 reported envenomations per year. Prior to work from my lab, we knew little about the phylogenetic distribution of venomous fishes with most previous estimates identifying just 200 venomous fishes. Following the results of my lab's genetic and anatomical studies, more than 2,500 fish species should now be considered venomous. Our more traditional systematic methods are now being combined with transcriptomic and EST data from a diversity of venom glands for a more genomic approach to venom evolution. As we move these studies forward, we are proteomic work to explore the evolution of these often harmful and potentially medically beneficial proteins. Ichthyology at KU is represented by a diverse group of five active researchers and collection managers exploring the evolution, systematics, ecology, and conservation of both recent and fossil fishes. Ichthyology serves the global fish community as a premier destination for research and training. More than a dozen of our students hold distinguished positions at universities, research institutes, and the US government. KU Ichthyology has three recipients (Gloria Arratia, Richard Robins, and Ed Wiley) of the Robert H. Gibbs, Jr. Memorial Award for Excellence in Systematic Ichthyology presented by the American Society of Ichthyologists and Herpetologists, and Andy Bentley has just rotated off as the President of The Society for the Preservation of Natural History Collections (SPNHC). 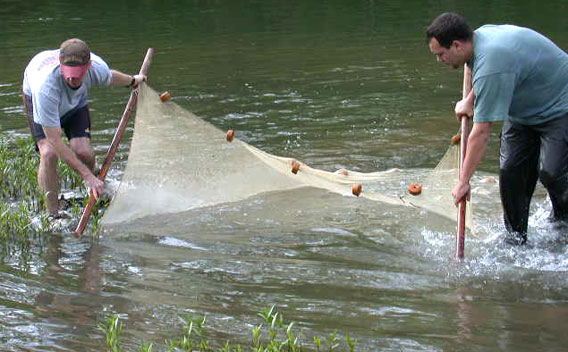 Ichthyology casts a wide net in its research on the evolution, biodiversity, genomics, and ecology of marine and freshwater fishes. The diverse researchers examine the large-scale phenomena that have shaped the history and diversification of fishes in both geographic space and geologic time using our collections, field studies, and work in our comparative anatomical and molecular laboratories. 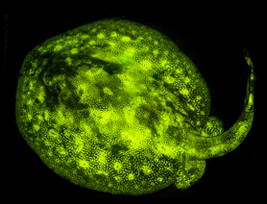 January 2014 — A study co-authored by KU biodiversity scientists demonstrated that biofluorescence was actually widespread in fishes and highly variable among species and between sexes. This research documented more than 180 species such as the Round Stingray (Urobatis), above, that are fluorescent. This open-access work was published in PLosONE and covered by dozens of media sources including National Geographic, Wired, New York Times, Nature, and CNN. March 2014 — A team of primarily KU researchers led by Matthew Davis published an open-access study in Marine Biology demonstrating species-specific variation in specialized light-producing organs in lanternfishes (Myctophidae), which suggests that these may facilitate speciation in the deep sea. The researchers hypothesized that differences in the position of the lanternfish light organs might work like different bird calls or different plumage patterns in birds to allow species living in the same environment to tell each other apart. This research was written up for stories ranging from Natural History Magazine to The Scientist and incorporated into a temporary exhibit on the Exosuit at the American Museum of Natural History.